Somehow I had missed the news. 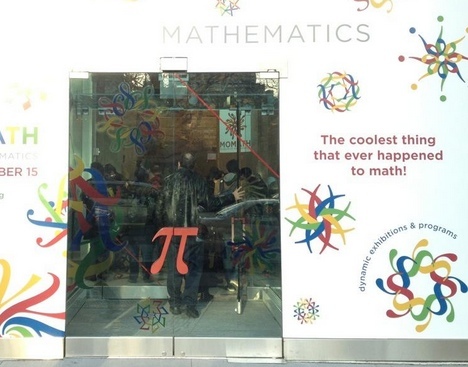 The Museum of Mathematics has opened in NYC on the north side of Madison Square Park. We did not go in. The museum had closed by the time we were there. I am eager to return and check it out. I am and have always been a math geek. And I love teaching math to my kids and anyone who will listen. It is magical stuff when you understand it. I am so happy we have a place where we can take kids in NYC, either on field trips or family outings, to get them into math and all that it can lead to in their lives. Here’s a short photo tour that gives a glimpse of what it is like. Jason sent me this video. I am adding it to this post.